Teatru Astra has been the Gozitan theatrical highlight for 50 years, after putting up productions ranging from world renowned operas such as “Aida” (1988) and “La Traviata” (2010) to, most recently, classic musicals such as “Grease” (2016), “Evita” (2017) and, of course, this year’s production of “Jesus Christ Superstar”, well known for songs such as the opening ‘Heaven on Their Minds’, ‘I Don’t Know How to Love Him’ and the iconic title song ‘Jesus Christ Superstar’. This Tim Rice (lyrics) and Andrew Lloyd Webber (music) rock opera premiered on Broadway at the Mark Hellinger Theatre in 1971 and has since received critical and commercial success amongst the public audience, in spite of its controversies due to the depiction of the infamous crucifixion of Jesus Christ. It is refreshing knowing how long a way this little Catholic island has come to not only accepting but appreciating productions such as this and allow it to establish our cultural status, especially in regards to our very own Valletta 2018 Project. The story focuses on the last week of Jesus’ life before his untimely death and explores the different challenges he and others have to face as the day draws nearer. This musical goes through great lengths to not only showcase Jesus as a man who needs to do what is best for others, but, most importantly, as a human who also struggles and experiences fear as well as enjoyment when in the company of others, and not just a religious figure who performs miracles and bestows good acts amongst those who are faithful to him. We also get to experience first-hand the concerns that grow in Judas, one of Jesus’ disciples that eventually betrays him to the priests and Caiaphas, the people responsible for his crucifixion. Seeing how this is a show about the events that eventually spawned one of our public holidays, Easter Sunday, it seemed more than appropriate to showcase its last performance on this date, not only being seen as a good marketing strategy but also as a means of establishing a different tone to their performance based on the impact the holidays are expected to have on it. It is for this reason that I decided to watch this performance on Sunday 1st April, especially given the curiosity regarding what the very first production of “Jesus Christ Superstar” in Malta and being led by a local and overseas director and cast could result in. To my satisfaction, it was quite enjoyable to watch all the way through. The most noticeable highlight of the entire performance was the energy from each performer and the powerful yet controlled vocals they all attained. In spite of the lack of diction at certain points, mainly in regards to the priests, there was still a notable amount of hard work put into this show which would not have been present if it weren’t for Hugh Wooldridge’s complex and fruitful use of direction. The detail that I found most interesting is how this production is typically performed in a contemporary setting, which in turn, affects the key visuals such as the costumes and set. In this production, however, the team decided that instead of going all out with the typical detailed costumes, glorious props and magnificent set designs that are commonly used in different productions of “Jesus Christ Superstar”, they focused on minimalism with a simple stage with two staircases, a high platform to perform on and a huge screen as the background. The screen played an important role throughout by offering the audience missing context that would not be present in the material alone, including the time and location of different scenes and a variety of traditional paintings that mirror the events taking place on stage. It also plays a huge part during one of the final moments of the show where Judas hangs himself out of guilt after betraying Jesus. In this scene, the noose is shown as an image on the screen which is then positioned in a way to create the illusion that he is hanging on it. The reason as to why this particular effect is so compelling to me is because it was at this point I realised how all electrical appliances in this production, whether it being the use of lighting (designed efficiently by director Wooldridge), the screen or even the electric guitar played tremendously well by Mark Galea, had an impact in the darker moments of the show. This is most notable during Jesus’ whipping in the song ‘Trial Before Pilate’ which was done by the use of brilliantly sequenced lighting that flashes from white to immediate red at every strike, until the entire set is lit red to reflect the goriness of the action. 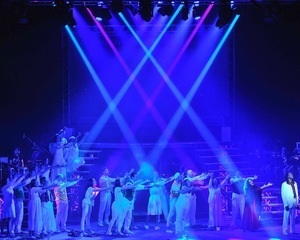 Light is so effective in this production that for the iconic crucifixion scene, a cross wasn’t even used but instead, a few simple spotlights that shone on Jesus and slowly faded away along with his life. We also get to understand the frustration Judas faces in this show by having Galea come on stage in the same costume as him whenever there is a noticeably difficult moment for Judas’ character and have him be faced off, being forced to confront his inner turmoil and guilt and reflect on his morals and choices as the somewhat damning riffs become more intense. It is not just this specific moment that can be seen as the high point of the performance in regards to music. In fact, music is played throughout the entire show (of course, what musical doesn’t do this?) and is conducted superbly by maestro Sigmund Mifsud who, can be seen based entirely on this performance, clearly has experience in conducting a large orchestra to perfection, especially when it comes to a 2-hour advanced piece such as this. No music is complete, however, without the use of vocals which, in this case, play a huge and important part. Each vocal in this piece is strong enough to command a stage, with the use of excellently supported belting, mainly showcased by the vocally talented David Michael Johnson who played the title role of Jesus and Chris Grech who portrayed Judas. We also get to witness a variety of carefully placed mid and chest voice, all of which are explored through our mains who are clearly strongly trained, whether as a stylised mezzo-soprano such as Rachel Fabri (Mary Magdalene), a theatrical tenor like Roger Tirazona (Pontius Pilate) or a powerful and booming bass such as Noel Galea (Caiaphas). Even the ensemble is visibly strong in singing, and didn’t fail to empower the entire theatre with their compelling performance in ‘The Temple’ and the eerie yet mesmerising ‘The Crucifixion’. A personal favourite of mine, as well as many others, is the surprising falsetto performance of Wallace Camilleri (Annas) whose character is typically presented as a countertenor, whereas in this production, all of his performance is done an octave higher, therefore creating a more comedic tone through his and the priests’ scenes, most notably in the ‘This Jesus Must Die’ sequence, and even manages to bring to mind a sort of Mary Patrick from Sister Act approach with his enthusiastic presence. A musical is never complete without one other major element that helps with storytelling: the choreography. “Jesus Christ Superstar” is mainly known for its music and not so much for the staging that goes into it. This fact appeared as an opportunity for co-choreographers Francesco Nicodeme (Simon Zealotes) and Felix Busittil who clearly wanted to make the most of these small opportunities by attempting to show off all the talent this company could provide in regards to movement. They did manage to succeed this one level, given the amount of energy that was present in numbers such as ‘Simon Zealotes’ and the ‘Finale’. The only downsides were that it was a bit noticeable at times that certain dancers are not as experienced as others and that, whenever there was a proper choreography, it seemed too stylised and didn’t appear to have as much substance or grounding as was necessary, especially when given the fact that this is what we get out of all the songs, and that the choreographies are meant to be showcased in that manner as well. Not all movement is dance based though, the production is also heavily reliant on staging, led by director Wooldridge. There is a very effective use of staging throughout this performance, whether to bring out comedy through use of slapstick in ‘This Jesus Must Die’ and ‘King Herod’s Song’, unsettlement through the distortion of bodies in ‘Trial Before Pilate’ or even to help us analyse and reflect on moments as seen in ‘The Temple’ which involved a battle between a roller-skating Adam and a Bo-staff-wielding Eve. It did, however, seem obvious at times when the cast was not given proper staging since it seems as though the actors (this is most clearly seen in some scenes with the disciples) don’t know what to do and therefore seem stiff. This is by far one of Tim Rice’s and Andrew Lloyd Webber’s most challenging pieces of theatre, and it was definitely enjoyable to see the people from this tiny rock take on this challenge. It was incredibly engaging throughout, not just for those of the old generation who were alive by the time this musical was first performed (you can easily tell who those people are based on the fact they’re the only ones who actually know the lyrics to the majority of the show!) but for youths who are given the opportunity to be exposed to performing arts and get to come up with their own opinion on it and what it has to offer. A big well done to the cast and crew who spent hours upon hours working hard on this piece and I know I am speaking on behalf of all who watched when I say the country cannot wait to see what else is in store for the future.